In my post from June 1, 2012, I briefly mentioned research logs and where to find them on the web. But these had to be printed and filled in by hand. Just yesterday I found an on-screen fillable and savable research log created by the folks at Brigham State University. I had seen the same form on the site of the 1997 Ancestors TV series but it was not savable. 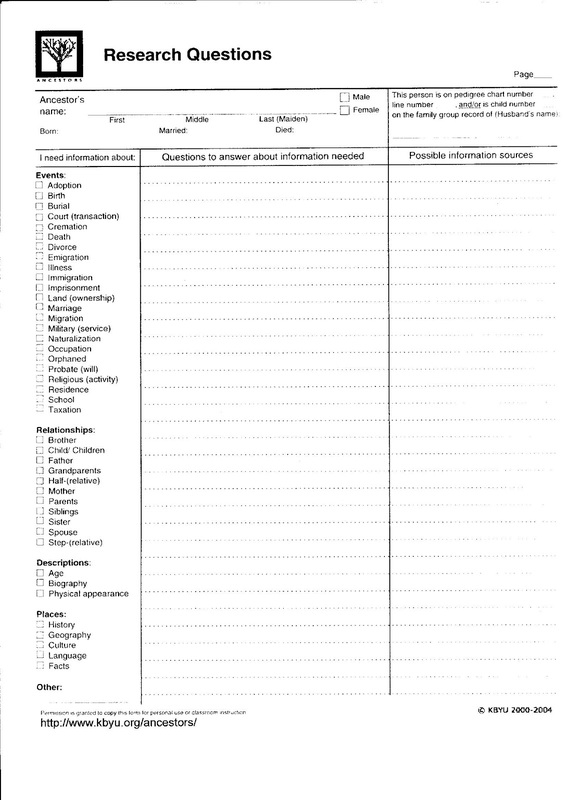 However, this site has several very useful forms for conducting research that I will discuss in this post. One step in my preparation for an upcoming research trip to Chicago (third week of Sept, 2012) is to have a research log showing the sources that I have consulted so far and what I have discovered. The log will also show the questions that still need answers. At the Ancestors TV site, I found a Research Questions log that serves as a lead-in to the research log. 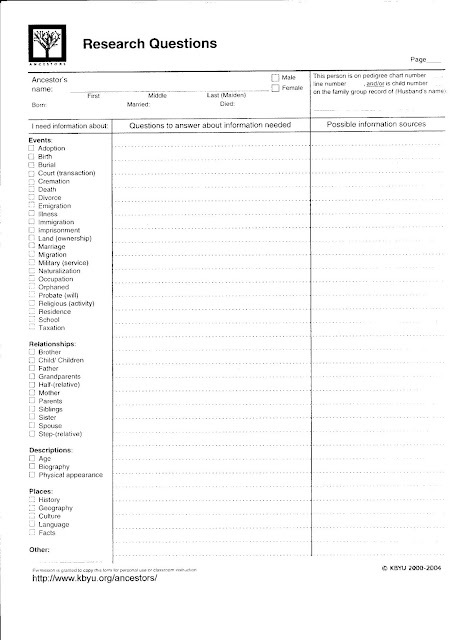 It is a brainstorming tool to help you focus on the areas you want to explore in an ancestor’s life, the questions you are seeking answers to in your search, and the possible sources that might have this information. A third research chart that appears on the Ancestor TV site is Source Notes This chart makes it easy to document each source that you find and provides lots of space to record the information found. You can be sure that I am going to make several copies of these forms to use in my upcoming trip to Chicago. 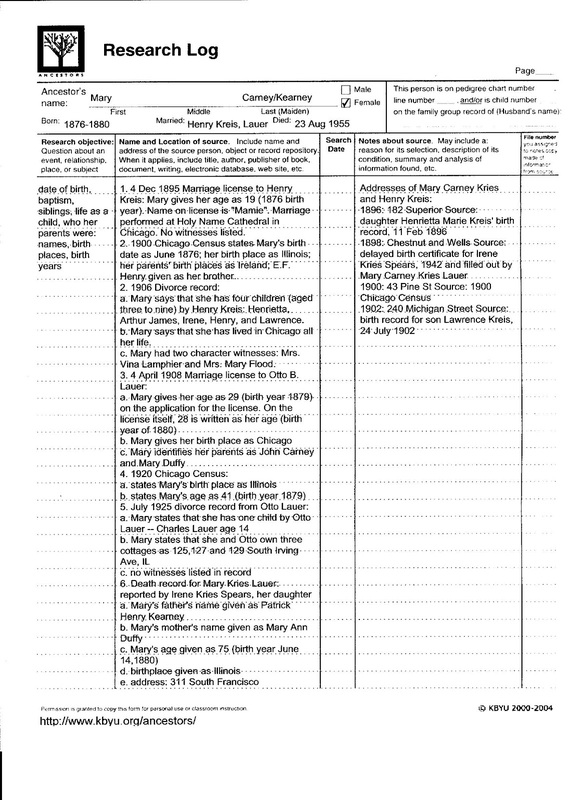 When I locate my first source at the Newberry Library or other research site, I can pull out my Source Notes form to record the information. 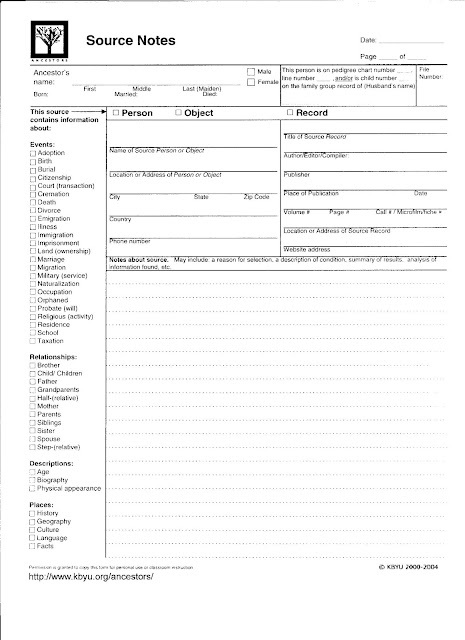 Use of this form will prevent me from jotting down notes on random sheets of paper. With these three forms, the researcher can achieve an organizational level that will guarantee a more successful search.